It’s been a long time since I’ve needed to give a baby a bottle but as a Mom, you don’t forget those harried months of juggling having a baby and all the care giving things that come along with it! If you’re bottle feeding, here’s a huge time saver that I think is ingenious – the Li’l Helper Bottle feeder($12.97). It’s both a toy and a bottle holder – basically it’s something for baby to hold onto and stay entertained with while they are taking their bottle. Feel like this is especially great for when they are old enough to hold something but not quite yet hold onto a bottle. Plus you know they just love to get their hands on whatever they can and the narrow sizes of this product are perfect for holding onto! It’s great for breastfeeding Moms who are pumping and using a bottle when on the go too – it’s ergonomically designed to mimic baby’s nursing posture. Li’l Helper is BPA-free and holds most bottle sizes. 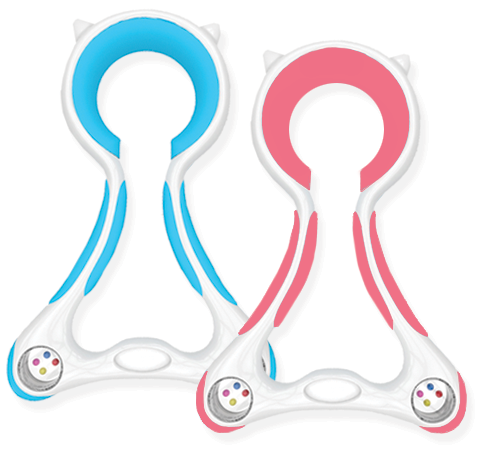 Get it online at LilHelper.com for $12.97 – it comes in pink and blue.